Support the American Cancer Society's mission to end the pain and suffering caused by cancer. Through funding of ground-breaking cancer research at local institutes such as Fred Hutch and Seattle Cancer Care Alliance, and providing patient services and programs locally in King County, the American Cancer Society is here to help people like you, in your community. 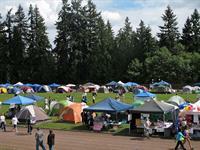 Through Relay For Life, the American Cancer Society's signature fundraising walkathon, volunteers in the Kirkland community can stand up to cancer, and make a difference by spreading cancer awareness, and participating as a sponsor or team, raising invaluable funds to support the American Cancer Society's Mission. 1 in every 100 people in the U.S are Relayers. Are you ready to join the biggest movement in the world to end cancer?